The Rifflin'Hitch Lodge is situated in the wilderness of Southern Labrador, Canada and this helicopter pilot will carry a maximum of 6 passengers at a time to this remote fishing location on the Eagle River. During a flight, the pilot allows us to take a picture of him and the hundreds of controls displayed around the interior. The Bell 427 Helicopter flown by this pilot is a twin engine aircraft which is fast, smooth and reliable giving passengers a true sense of security when on board. The only way to this lodge is by helicopter or floatplane, allowing people a chance to see the scenic landscape of Southern Labrador in one trip. 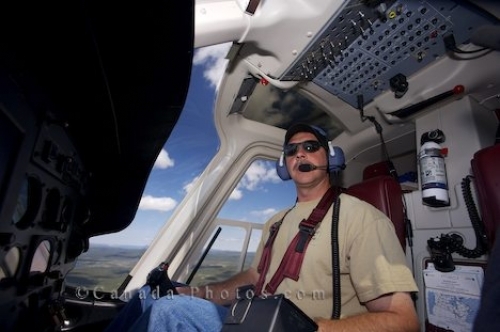 Picture of the helicopter pilot who transports passengers to and from the Rifflin'Hitch Lodge in Southern Labrador, Canada.